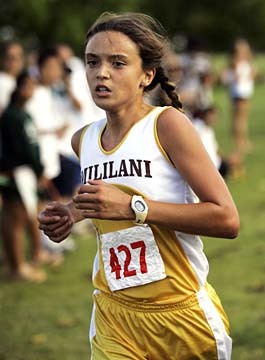 Mililani cross-country runner Kristin Ali Keith placed second in the state meet a year ago and won last week's OIA title race. HERE'S a story behind the braids. Until March of this year, Kristin Ali Keith ran with her hair tied in a ponytail. With her long locks trailing behind her, Keith ran to a second-place finish at last year's state cross country championship as a freshman. Then her father suggested a change. "He basically said that (my ponytail) caused drag," Keith said. After a bit of resistance, Keith eventually tried braiding her hair and took a liking to it. Last Saturday, Keith -- sporting her now-signature braids -- capped off a strong sophomore season by defending her Oahu Interscholastic Association girls individual cross country title, striding away from the rest of the field to complete the 3-mile course at Central Oahu Regional Park in 19 minutes and 58 seconds. Tomorrow, Keith and her Trojans teammates fly to Maui for the Honolulu Marathon/Hawaii High School Athletic Association cross country state championships on Friday at the Kapalua Village Golf Course. Despite her runner-up finish in last year's state meet, Keith demurred when asked if she considers herself one of the front-runners for this year's individual title. "I truly do think there are a lot of great runners out there," she said. "I'll just run hard, and we'll see when (the race) happens." The 5-foot-4 Keith's success, of course, is more a product of hard work than hairstyle. "As a runner, (Kristin) doesn't have special tools that other runners have, but she just really works hard," said Shane Akamine, Mililani assistant coach. "She likes to run, and it helps push her through the tough parts of a race." Keith's offseason regimen provides ample evidence of her work ethic and enthusiasm. Throughout the spring and summer, she rouses herself between 4:30 and 5 a.m. for training runs. Kristin Ali Keith took a tip from her father, Bill, and wears braids instead of a ponytail, which he says causes more drag. Keith also got up before dawn to run with her father and his teammates on an Army team when the family lived in Alabama from 2003 to 2005. "We (ran together) for fun," said Bill Keith, a chief warrant officer 4 with the 25th Combat Aviation Brigade at Schofield Barracks, just back from a 15-month deployment to northern Iraq. "(Running is) our link, our common bond that we're able to share," he said. "I feel real fortunate that we've established that commonality." The family fun runs paid off. In 2005, Kristin ran varsity cross country for Providence Christian School (Dothan, Ala.) as an eighth-grader and placed third in the state. Keith still enjoys testing herself against strong competition. In addition to four decisive first-place finishes this season, she placed third last month at the Kaiser Invitational and fourth at the Iolani Invitational, both of which included fields studded with runners from mainland schools. "I liked that there was the extra challenge," she said. "I always get more nervous, but it doesn't really change how I run." "She's always been very driven," said her mother, Kris Keith. "She has been since she was little. No one was going to tell her she couldn't do something." Though Keith also competed in soccer, basketball and swimming, perhaps it was inevitable that she would decide to concentrate on running. "(My wife) blames me because when (Kristin) was a baby, we would always race to the swing set," quipped Bill. Keith also is ahead of the pack in the classroom, where she's taken on chemistry and world history a year earlier than most students. And on Fridays, her only day off from practice, Keith cleans classrooms at Mililani Middle School to earn extra spending money. "The biggest challenge for me is to make sure she doesn't take on too much," said Kris Keith. Though only a sophomore, Keith is one of five co-captains on the Mililani cross country team. "She's been through the program, so she helps the younger kids coming up," said Trojans head coach Edwin Alfaro. "She's a good example because she does the whole workout." "She's always seemed mature for her age," said Kris Keith. "I don't know whether it's the military and moving around. She learned at an early age that she had to be the one to approach people to introduce herself." Keith's victory on Saturday was the first race that her father could watch in person since he dispensed his tongue-in-cheek hairstyling tip following a track meet in March during a brief R & R trip back to Hawaii. While in Iraq, Bill Keith relied on e-mail, the Internet and phone calls spanning a 13-hour time difference to keep tabs on his daughter's performances. "It's great to see (her hard work) come to fruition," he said.